Dealing with the stresses that accompany college life can not only affect a person physically, but emotionally too. For many, this causes students to experience anything from anxiety to full-on depression. According to learnpsychology.org, in 2014, the rate for student depression rose to more than 9.5 percent. Although every day it may be difficult, there are many ways for students to deal with mental health issues that are outside of the medicinal spectrum. Annie Baker, senior psychology major, said since she was younger some sort of sport or exercise has played a factor in how she deals with stress and anxiety. “I suffer from anxiety and I have the medicine, but medicine doesn’t always help and it has side effects,” Baker said. Dealing with anxiety, Baker has been prescribed medicine, yet still finds exercise helps her gain a peace of mind. Jeffrey Biddle, director of the Counseling Center, said the No. 1 type of mental health issue that is seen across college campuses nationwide is anxiety. “With anxiety it is everything from test anxiety, regular day-to-day stress, all the way up to panic attacks,” Biddle said. Biddle said there is also depression, eating disorders, suicide and psychosis, which are the Big Five that are looked at. “In the Counseling Center we deal with the spiritual and emotional side, but there is a huge component, which is the physiological side,” Biddle said. Exercising and getting up to go to the gym can be difficult, but for anyone dealing with any type of mental health issue it can be much harder. For people dealing with anxiety, Biddle said exercising almost mimics the anxious feeling they already have, which is why they may not want to do any exercise. “Scientists have shown that exercising, eating right and sleeping has the same efficacy as antidepressants or anti-anxiety medication does,” Biddle said. Biddle said those who come through the Counseling Center not only get the help they need there, but they collaborate with the Recreation Center to make sure students are getting well-rounded help. 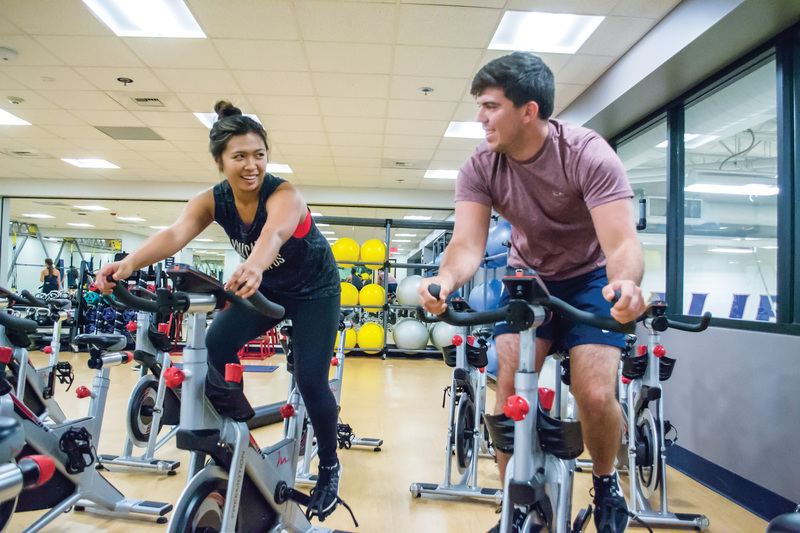 Leslie Perry, graduate student in kinesiology and wellness intern for the Recreation Center, said exercise releases endorphins and that makes people feel better during exercise and after exercise. “For students, because they’re super stressed out with school, I think it really helps them to come and have fun,” Perry said. The Rec Center comes equipped with all sorts of workout machinery, classes and personal trainers, so if a student does not feel comfortable with one outlet, there are other options. For anyone who is seeking any help or any information regarding stress, anxiety or any mental health issues, both the Counseling Center and Rec Center are available to all students. The Rec Center is located near Lancer Plaza, and the Counseling Center is accessible through Diana st. at the back of the school.